This album is the third in the series of musical selections from MPA’s Vitak-Elsnic Collection. The CD features16 selections of classic polkas and waltzes, and one schottische originally published by the Vitak-Elsnic Company, MPA’s predecessor. The songs were performed by the Ohio-based Vitak-Elsnic Tribute Band. All members of the band were born and raised in northwest Ohio. Band members include brothers Kent and Todd Harris on trumpet; Steve Harris on baritone, trombone, and piano; Dennis Schwiebert on tuba; Ron Ehrman on accordion; and Ted Lange (leader of Squeezebox Band) on drums and piano. The album was recorded at Lange’s Powerbox Studio in Ridgeville Corners, Ohio.The album name couldn’t be more filling! Guest artist Marie Omann from Minnesota also performs on piano. The band’s unique brass-focused instrumentals have a unique mellow, yet lively, sound that’s guaranteed to lead to uncontrollable toe-tapping and humming along to the music. 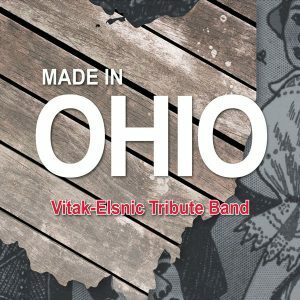 This album is dedicated to the creative musical and business genius of Louis Vitak, a Bohemian immigrant who came to Ohio in 1881, and his nephew Joe Elsnic. Together, they formed the Vitak-Elsnic Company in Chicago, which by the end of the 1920s had become America’s premier publisher of music in the polka genre. Vitak and Elsnic not only published but also composed or arranged many of the thousands of selections sold by the company. You’ll love the interplay of melodies, harmonies and countermelodies in these songs and, if you allow yourself, you might even swear you hear Louis Vitak on the accordion or Joe Elsnic playing along on the tuba. They have passed on to that great polka dance hall in the heavens, but the band is pleased to pay tribute to them with this album.